If you’re using a PC, you may want to make sure your Java is up to date. 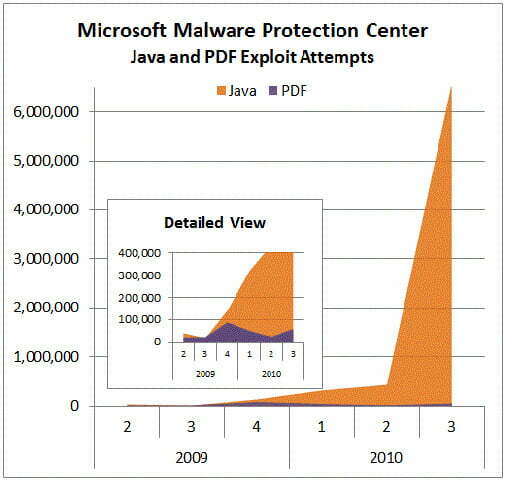 Yesterday, Holly Stewart, of the Microsoft Malware Protection Center, highlighted the “unprecedented” number of Java exploits that have occurred in 2010. In her blog post, Stewart said the Java attacks have spiked from under 300,000 at the beginning of the year to well over 6 million, and growing. The main problems: Java is used ever more frequently, threats are hard to detect, and users aren’t upgrading to fix security holes. The majority of exploits center around three particular vulnerabilities, all of which have fixes available for download. But is the company doing enough to stop these threats? Brian Krebs, a security reporter, thinks Sun, and parent company Oracle, have been given a free pass. Krebs also points out that Java’s updater only checks for updates once every two weeks, and often fails to detect if a new version is available. On October 12, Oracle released a massive patch that fixes 29 bugs and security holes in Java. That patch can be downloaded here.